The Art of Paper Cutting to enhance all your projects. There are many ways to practice the art of paper cutting, to get the looks you want, for your cardmaking projects. And all have their own special qualities. Try Paper Pleating ... Piecing ... or just simply tearing the paper can all give a different feel to each card and these simple techniques can be done by hand. But what if you want something a little more elaborate. Here is one paper cutting system that can give you results easily and quickly. This Freestyle Mouse Cutting Kit is so versatile. It is from Purple Cows and features their Click Blade system. This makes it very easy to swap and change the blades for a different look each time. The blade won't cut the paper until it is pressed down. In the kit you will get the mouse, 10 fancy edged blades, a straight edge and a perforating blade. All of them stored in their own "click" holder so that you can keep them on your work top safely, and ready to use whenever you want them. 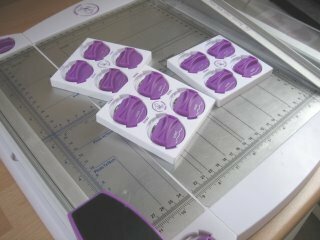 You are supplied in the kit with a cutting mat and a ruler with a central slot. ... or to help you use the fancy blades in a straight line too. But of course as the name suggests you can also use the mouse "freestyle" and get an individual look. 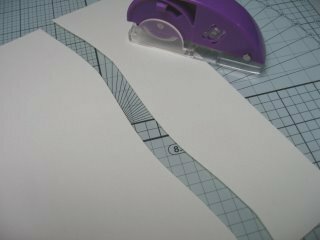 Take the mouse and press the blade down and run it through the paper to give the desired shape you want. 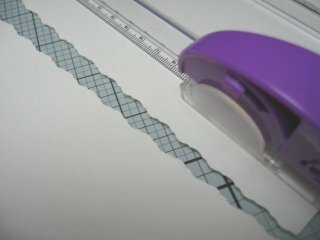 Have a play with this very versatile tool and practise the art of cutting paper. 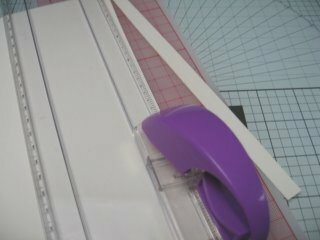 I also have the Purple Cows Paper Trimmer which also has the "click Blade" system. 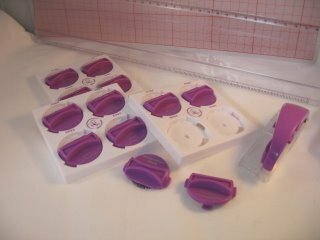 And all of these blades can also be used in that piece of equipment too which then gives me a greater versatility in my cardmaking.